We kicked off our spring season at the Barbican and Wellcome Wonder Street Fair at the British Festival of Neuroscience London (7th – 10th April) with ‘The Mind in the Cave’. 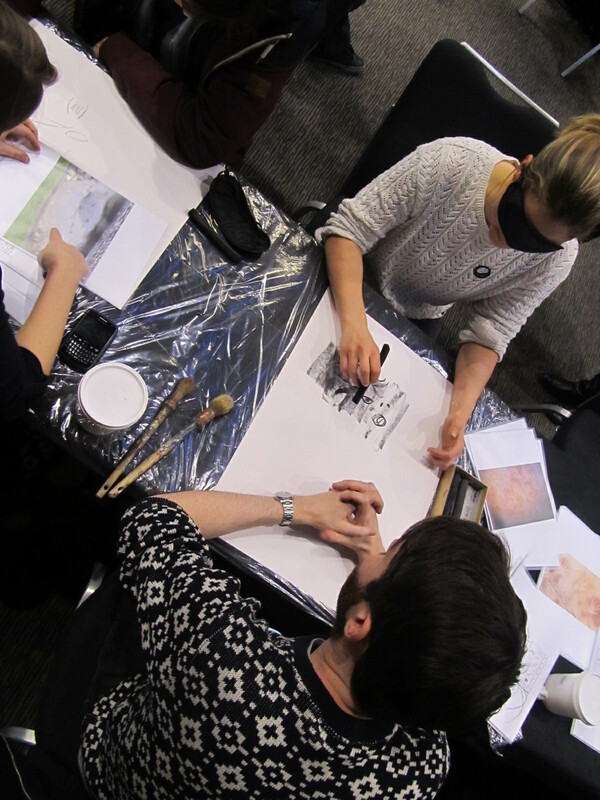 This is a dynamic, hands on (but eyes off) activity – conceived by the artist Paul Evans – that allows participants of all ages to engage with the earliest art known to have been made by humans. We explore the role of Phosphenes in art. Phosphenes are the strange patterns consisting of waves, dots, zigzags, grids, and nested curves that sometimes appear in front of our eyes during blackouts or under conditions of sensory deprivation. This phenomenon may have been the origin for the universal abstract art forms and motifs that appear in cultures around the world. There is a short interview with the artist Paul Evan who explains how we generated the images below. (a) a basic grid and its development in a lattice and expanding hexagonal pattern; (b) sets of parallel lines; (c) dots and short flecks; (d) zigzag lines crossing the field of vision (reported by some subjects as angular, by others as undulating); (e) nested catenary curves; (f) filigrees or thin meandering lines. Can you see these shapes in the participant generated art….is the human nervous system and its capacity to produce entoptic visual imagery he same as today as in prehistory?